The votes have been tallied and a huge round of congratulations are in order. 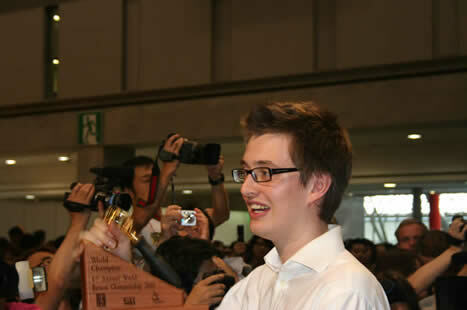 Props to James Hoffman, of La Spaziale UK Ltd. and jimseven fame (jimseven.com has linked over here often), for winning the 2007 World Barista Championship (WBC) today in Tokyo: Briton is crowned world espresso ‘barista’ champion at Tokyo contest (International Herald Tribune). Heather Perry, 2007 U.S. Barista Champion (and regular Western Regional champ), placed second and scored the best cappuccino. This is the highest ranking an American has achieved yet at the WBC. James is formerly of La Spaziale. He hasn’t worked there in many months.